The best place to start watching birds is close to home. Birds are present in most yards and gardens, no matter how small or urban the space may be. But why settle for the random robin? If you provide birds with a few perks and pleasures, they’ll hang around your yard because it’s a nice place to be. Birds need four basic things to survive: Food, water, shelter, and a place to nest. You can attract birds with these four offerings, no matter where you live, even in the urban heart of a large city. The first three — food, water, and shelter — are fairly simple to offer. The last, a place to nest, requires a bit more effort, but offers far greater rewards to you and the birds. Consider your bird feeding to be an ongoing experiment. Use trial and error to determine what foods your birds like. Also experiment with how you offer the foods to birds, because not all birds like to eat in the same way. Not all people like lasagna, or drumsticks, or drive-through windows, or fancy restaurants, and not all birds like all bird foods or all bird feeders. Where you live in North America has a bearing on what birds you can attract to your yard. The birds at the feeders in a rural Ohio farmyard are very unlike those in a central California yard. The latter gets California quail and yellow-billed magpies, the former cardinals and blue jays. Seeds. Bird feeding involves seeds. Black-oil sunflower seed is the most universally used seed for bird feeding because it’s eaten by many feeder visitors, including chickadees, titmice, finches, grosbeaks, cardinals, jays, nuthatches, and woodpeckers, among others. Bird feeding’s other popular seeds include: striped sunflower seeds, sunflower hearts, millet, safflower, cracked corn, peanuts and peanut bits, niger or thistle seed, and mixed seed containing milo, wheat, millet, and cracked corn. Start simply, and then expand the feeding operation at your own pace. After you’ve got the basics down, you and your birds can move on to other areas of bird feeding, including offering fruits, nuts, suet, and specialized foods and feeders to cater to (or discourage) certain feeder visitors. Few creatures on the planet can survive without water. Birds are no different. Birds need water for drinking, to help with digestion, and for bathing (see Figure 1). 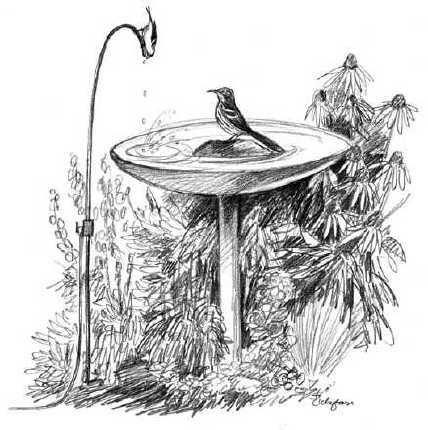 Figure 1: An American goldfinch and a brown thrasher enjoy a birdbath with a dripper. Fine tubing connects to an adapter at the hose spigot; a stopcock adjusts the rate of drip. There’s nothing worse for a bird than a bunch of dirty, matted, haven’t-been-washed-in-days feathers. Dirty feathers don’t insulate well, they don’t offer optimal flight, and, let’s face it, dirty feathers don’t look good. You can do your part for avian hygiene by offering water to the birds in your yard. If you don’t have a naturally occurring stream or pond on or near your property, consider putting out a birdbath. The surface of the bath shouldn’t be so smooth that birds can’t get a secure footing. If it feels slippery to you, consider roughing up the surface of the bath a bit. Or consider adding a few handfuls of small, coarse gravel to the bottom of the bath. This makes for better bird footing. Flat rocks should be placed in the water to provide shallow areas and secure footing. Not all birds like total-immersion bathing. If you can’t put your birdbath in the shade of a tree, place it near some type of cover. Birds get nervous when they’re all wet (wet birds can’t fly well). Shelter makes them feel better and, if shelter is near, they’re more likely to stop and bathe than to sip and fly, or not stop at all. Regularly clean your birdbath, at least once a week. Birds drink this water. If you had to drink out of your tub, wouldn’t you rather it had just been cleaned? Suppose you’re a white-throated sparrow absent-mindedly kicking through the seeds scattered on the ground below a feeding station. Suddenly, one of those annoyingly perky black-capped chickadees sitting on the tube feeder above you gives an alarm call that means a hawk is nearby. Lucky for you, the kind human owner of this backyard has placed the feeders near several evergreen trees and a humongous brushpile (see Figure 2). 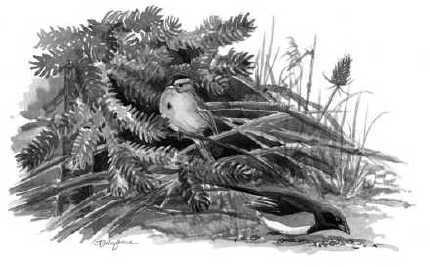 Figure 2: This brushpile provides welcome respite for a tree sparrow and an eastern towhee. Good shelter. That’s why you liked this yard and decided to stop here for a bite to eat. Being a denizen of the brushy field edges, you calmly hop into the center of the brushpile and wait for the sharpie to get bored (or lucky) and leave. A backyard can have all the perfect feeders and best bird foods, but the birds will ignore it if no decent shelter, or cover, is available nearby. They’re not stupid. Like people, birds need shelter from bad weather. And birds and people want a cozy place to sleep, roost, and hide from predators. Where is the nearest place you can go to hide from danger? What about in bad weather? Are the feeders exposed to direct wind, snow, or rain? If no shelter is convenient to the area of the feeders, create some shelter, such as an instant brushpile. All birds that venture into your yard benefit from a varied habitat. Some species take advantage of human-made shelter — commonly called birdhouses or nest boxes. Birdhouses come in hundreds of shapes and sizes, designs, and colors. As you get to know the birds in your yard, you can target the housing you provide to maximize the birds’ benefit. Among the species that use housing are bluebirds, chickadees, titmice, woodpeckers, nuthatches, swallows, some flycatchers, and even a few warblers, ducks, hawks, and owls. But remember, not all birds use birdhouses, just as not all birds visit bird feeders. Any experienced bird watcher will tell you that you find the most birds in the “edge habitat.” Edge habitat is the area where two or more habitat types meet, such as where a meadow habitat meets the edge of a woodland habitat. Or where a thick, overgrown brushy area abuts a roadway. The greatest variety of habitat occurs where habitat types meet, so it’s not just a coincidence that edge habitat is where the birds are. Birds preferring each individual type of habitat can potentially be in the place where these habitats meet. And with some creative thinking, that place could be in your backyard.